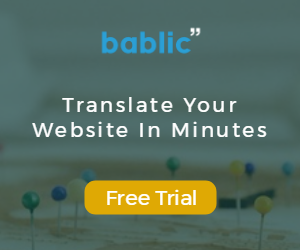 Bablic is a hands-off complete website localization solution. No more building a new website, making extensive changes to your back-end, changing your website’s structure to accommodate a new language, dealing with translators, agencies and so on. That is all in the past, and the future of website translation is Bablic. Make your website multilingual in 3 easy steps. Submit your URL, make the necessary changes in terms of content, images and layout, and simply publish your new language by copy/pasting our code onto your website. That’s all. Choose from FREE machine translation or easily upgrade to professional human translation, the same used by companies like Google, Expedia, IBM and countless others. All at the click of a button right from Bablic’s easy-to-use editor, and at a competitive price thanks to our partnerships. Get new native content published directly on your website within 48 hours! On top of that, Bablic detects when you update your original website’s content, and automatically updates the additional languages. Bablic also acts as a translation memory system, saving you from translating anything twice, or paying to do so. These are just some of the features Bablic is now offering. In order to get the whole picture, I strongly recommend testing it out, for free, right here. Interesting! Did you create this? Yes, I like your wordpress and thank for reading my wordpress. This were very helpful infor. Very innovative. I think you’ve got a winner.